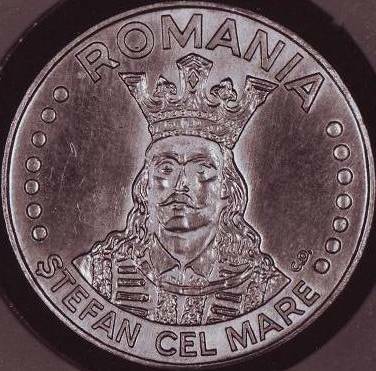 face value "100 LEI", year 1991, a wreath formed by six stylized oak leaves, a sector of 15 pearls above ROMANIA, "ŞTEFAN CEL MARE" meaning "STEPHEN THE GREAT", two seven pearl sectors, bust of Stephen the Great and the Holy. Near the left shoulder lies C.D. standing for Constantin Dumitrescu, the engraver's name. The pattern belonged to the former collection C. Ciuplea. 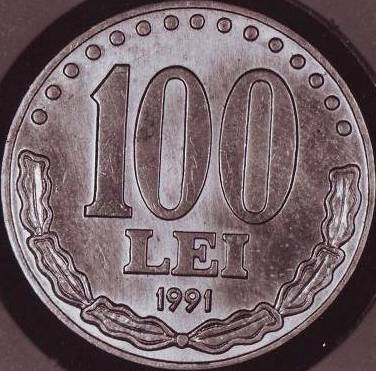 This design was used for the circulation coin of 20 lei from 1991-1996. Besides the face value, on the business strike the position of letters C.D. was slightly modified.